Cough headache is a headache associated with coughing and other types of straining such as sneezing, laughing, crying, blowing your nose or any type of valsalva maneuver. These headaches are divided into two types; Primary and Secondary. Primary cough headaches are benign. They have a male predilection and usually occur in ages of 50-60 years. 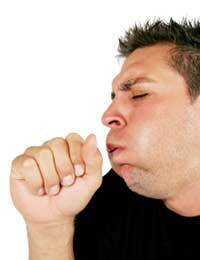 They occur quickly after coughing, are severe in intensity and only last a few seconds to a few minutes. They originate in the occipital area and may radiate forward. Secondary cough headaches are associated with structural brain abnormalities. The symptoms are similar but they have associated neurological abnormalities such as dizziness, unsteadiness or fainting. Secondary cough headaches can be caused by a brain tumor, blood vessel abnormality or an issue with a part of the brain called the cerebellum ( Arnold Chiari malformation). The age of onset of secondary cough headaches is in the 20s and 30s and has an equal male and female rate. MRI and CT scans of the brain are used to look for intracranial abnormalities. Angiography is used to look for intracranial aneurysms. Cough headaches can mimic other causes of headache such as migraine, cluster headache and chronic paroxysmal hemicrania among others and must be excluded as causes of headache. Treatment of primary cough headache may include Indomethacin( a non steroidal anti-inflammatory), Acetazolamide ( a diuretic that decreases fluid in the brain) and Propanolol ( a beta blocker that reduces blood pressure and relaxes blood vessels). The treatment of secondary cough headache is to address the underlying intracranial cause. This may necessitate surgery to fix intracranial aneurysms or remove brain tumors.